As I drove into West Harney Lane and South Ham Lane in Lodi, California, I just started to love how quiet and beautiful the little California city is. Laid back yet with the basic essentials seemed like a good city to live in for me. I had an appointment for the dermatologist that day but I came in 2 full hours too early so I decided to check out a food place in town. So I drove through Kettleman Lane, which I suppose is one of the major avenues in Lodi. A huge signage for Target caught my attention and I pulled up right there. There were many restaurant choices: Papa Murphy's Pizza, Chipotle Burger, Jack in the Box. All too familiar as they all had presence in Stockton where I live. So I settled for the one restaurant that I didn't see in Stockton: Coco's Bakery and Restaurant. I ordered a pie in season as recommended by one of the crew and a pancake breakfast combo. The literature at Coco's Bakery and Restaurant screams how good their pies are displaying all the accolades and awards it has won them over the years. Most of these awards were from the American Pie Council. So of course, they got my attention. I asked what was good and one of the crew suggested the caramel apple harvest pie which was in season. I heeded her suggestion. 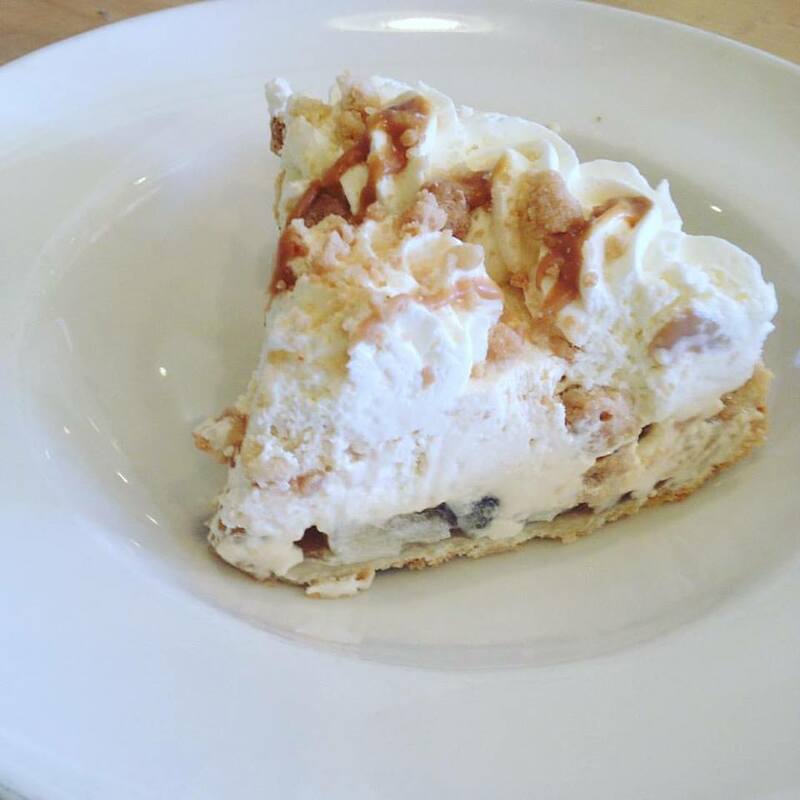 The pie crust was layered with apples that had a strong cinnamon flavoring, whipped cream, and caramel drizzle. The menu indicates that there was a caramel chiffon in between the apples and whipped cream but I barely noticed it. It was a treat for the sweet tooth, specially the part above the apples. The cinnamon-flavored apples came too strong for me as I am not a very big fan of apples anyway. I love breakfast food so I ordered some. It was noon and I haven't had breakfast. But it's a good thing Coco's has an all-day breakfast menu. 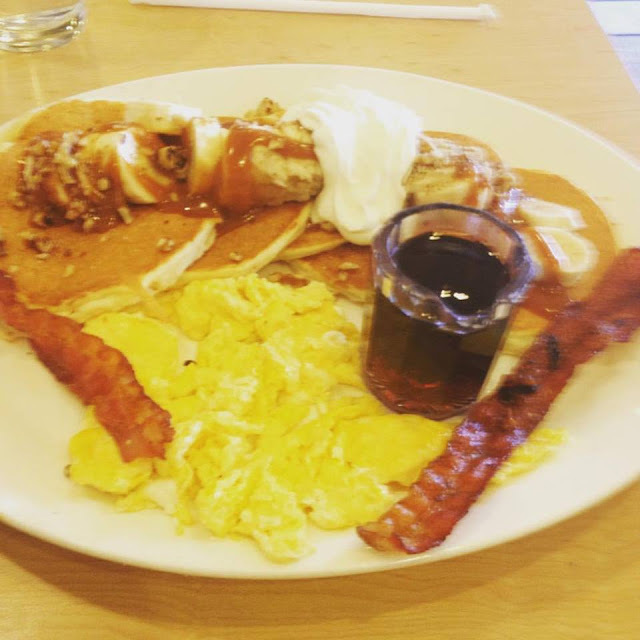 The fresh banana, walnut, and caramel gluten-free pancakes caught my attention so I ordered it along with my caramel apple harvest pie. It's a stack of 5 little pancakes topped with banana slices with walnut bits and served with 2 eggs done any way you wish (I had mine scrambled), and choice of bacon or sausage (I had bacon of course!). Prices at Coco's are really not bad either. I paid USD 15.93 for my meal.